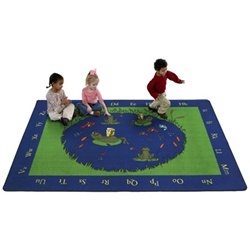 Create a calm teaching environment with Flagship's new rug called Frogs. With soft colors and themes, Frogs can motivate kids to read and learn in your special area designed just for reading. The bright blue water adds a soothing sensation making the perfect learning environment.